For the 1 in 5 students who have dyslexia, “Back to School” means a return to misery due to their unexpected struggles in reading, writing and spelling. DyslexiaLand is an imaginary place, but a very real one for the 1 in 5 students with dyslexia. Especially in school, where these otherwise bright children struggle unnecessarily, and parents don’t understand why or how to help. Parents are surprised, even shocked, to discover that most public schools do not teach dyslexic children in the way they learn, and they must take action and overcome many challenges to get the quality education their children deserve and is required by law. Happily, help is at hand! In DyslexiaLand: A Field Guide for Parents of Children with Dyslexia, parents will find the help they need to navigate the tricky territory of DyslexiaLand with proven strategies, easy-to-follow directions and maps. • How to identify your child strengths and challenges, meet with teachers, and to effectively advocate for your child. • Which reading approaches work for students with dyslexia, and which ones don’t, and why the “D” word is such a hot-button issue. • How to turn obstacles into opportunities, stresses into successes, and how high tech can be a huge help. DyslexiaLand takes the guesswork out of dealing with dyslexia. Whether your child is beginning pre-K or in the middle of high school, there is help here for all dyslexic kids and their parents. 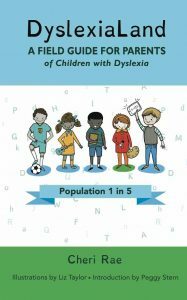 DyslexiaLand: A Field Guide for Parents of Children with Dyslexia ($20 ISBN: 978-0934161-75-6) is available from Amazon, select retailers and DyslexiaLand.com. For more information about the new book, author Cheri Rae, or for interview requests, visit DyslexiaLand.com or call 805-845-7102.